Dye for all smooth and grained leather. Ravinn Leather Dye is a stain that strikes deep into the grain. You can intermix colours. Does not affect the character and softness of leather. Do not use on plastic. Recommended for dyeing and renovating shoes, bags and all leather goods. Recommended upon suede and nubuck items. Shake the bottle. Test first in an inconspicuous place. Clean finished leathers using Waproo Stripper. 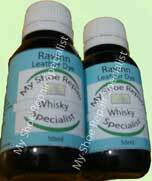 Apply Ravinn Leather using an applicator brush or wad (not supplied). When dry, seal with Waproo Renovating polish of the same colour. Do not use on plastics and vinyls. Before Dyeing clean item with Waproo stripper to remove any build up of polish grease or grime.